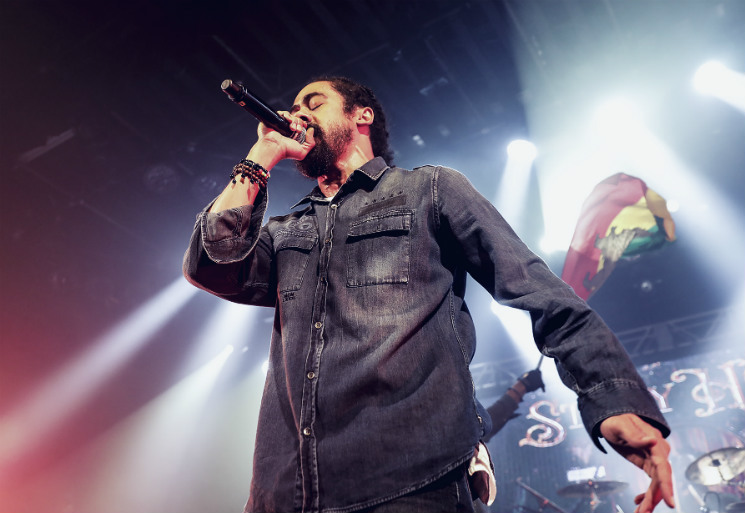 There was a distinct sense of positivity that never — not for a second — dropped during Damian "Jr. Gong" Marley's performance at the sold-out Commodore Ballroom on Tuesday night (September 26). It wasn't due to the thick clouds of marijuana smoke that clung to the air, but rather a vibe that Marley exuded from the moment he skipped onstage. Alongside a fantastic band, a spirited pair of backing singers and a comrade who tirelessly waved the Rastafarian flag for the entire near-two hour set, Bob Marley's youngest son played a seamless combination of classics and fresh material from his highly anticipated recent release, Stony Hill. When introducing new songs, Marley propped his foot up on the stage speaker and leaned in intimately, sharing background stories and intention. He discussed the medicinal and healing benefits of cannabis before transitioning into "Medication"; modern technology for "Time Travel"; and parents who sacrifice for their children's future for "Living it Up," a punchy, soulful highlight. Both Marley's delivery and presence were consistently energetic, fierce and engaging. "Beautiful," from Welcome to Jamrock, had him swinging his signature floor-skimming dreadlocks, and Halfway Tree's "More Justice" yielded smooth vocals and chanting from the crowd. Throughout the evening, Marley encouraged the audience to keep their hands raised up. He urged them to sing "with guts" to the powerful "No More Trouble," from Bob Marley and the Wailers' 1973 album, Catch a Fire. Tributes to Marley's father were woven into the set: the chorus of "Move!" was "Exodus"-infused; an ebullient rendition of "Is This Love" had Marley rocking side-to-side with open arms and closed eyes as he took in the room's impassioned singing; and "Could You Be Loved" was utterly triumphant. An encore was demanded so vigorously the walls shook, and when Marley returned to the stage he spoke about struggle and injustice. "If you're not part of the solution," he began, to which the audience answered: "You're part of the problem!" "So a Child May Follow" was a poignant moment with sparse instrumentation, and Marley's voice was focused and tender. The energy ramped up when special guest Kabaka Pyramid came to the stage, and Marley animatedly joined in on the vibrant track. Fan favourites "Road to Zion" and "Welcome to Jamrock" were saved for last and were, as expected, magnificent. With lighters up and smiles across their faces, the crowd was left with a benediction from Marley ("God bless you," he said) and an enduring feeling of joy.